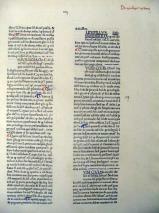 Bartolus de Saxoferrato (Bartolo de Sassoferrato) 1313-1357 was an Italian lawyer and law professor at Perugia. 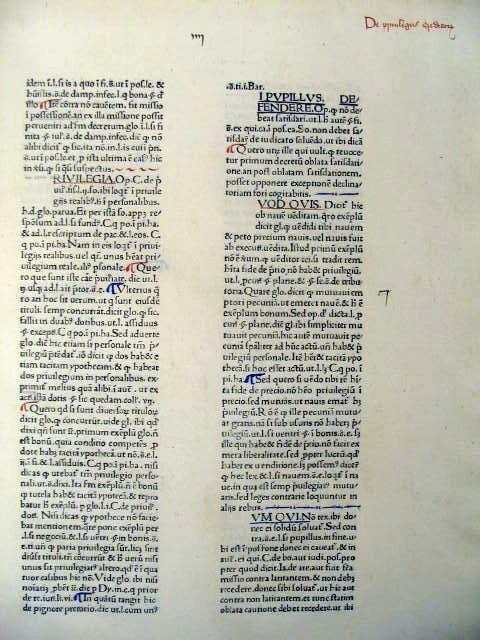 He was a noted commentator (postglossator) on roman civil law (Justinian’s Corpus Juris Civilis) and the most influential jurist of the medieval age. His writings were referred to throughout Europe. There was a saying “Nemo Bonus Iurista Nisi Bartolista.” (No one is a good jurist unless he is a Bartolist). He specialized in applying Roman law to contemporary issues. Byzantine emperor Justinian I codified the Roman civil law into the Corpus Juris Civilis (529-534). 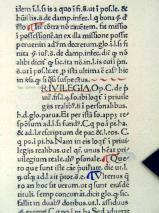 One section of this codification was the Digest (or Pandects). 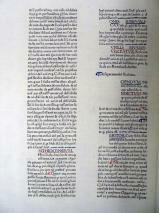 This Digest was divided into three parts: Digestum vetus, Infortiatum, and Digestum novum. 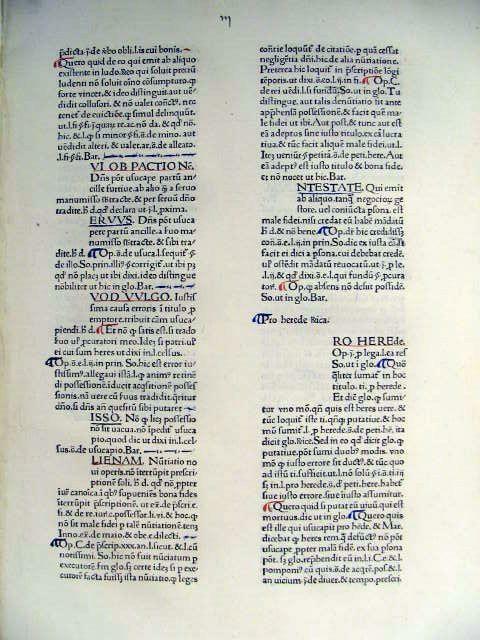 These three parts were found in an ancient manuscript that belonged to Pisa, but was taken by the Florentines in 1406 when they conquered the town. The Florentine manuscript was the chief source of information about the Roman law. 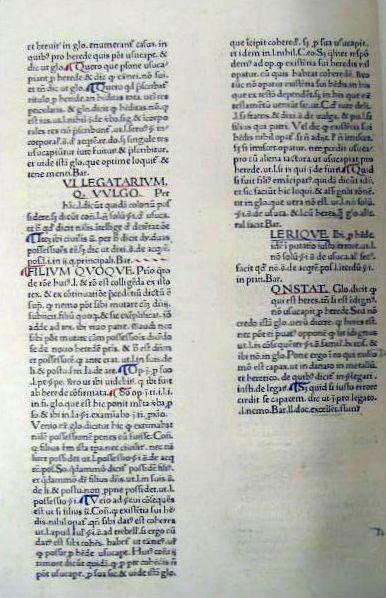 This book Digesti Novi was a legal commentary by the noted law professor Bartolus de Saxoferrato. Our two leaves have two columns of Roman type. There are 50 lines of print per page. 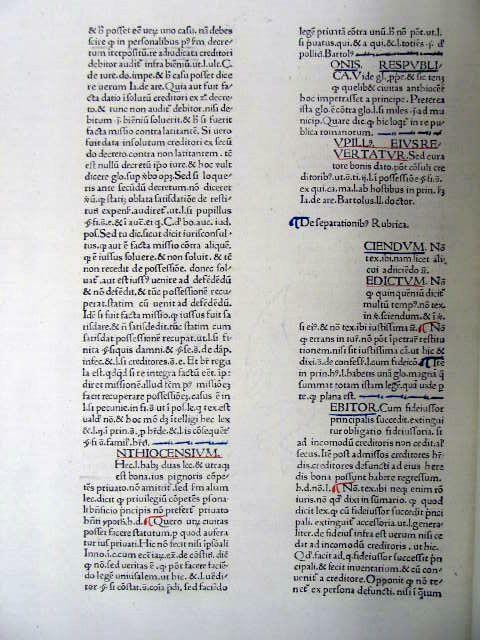 The paragraphs and some capitals are marked in red and blue. 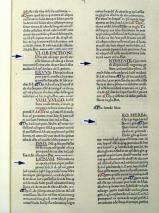 A number of blank spaces have been left to be filled in by the illuminator. There are decorations that are used as space fillers. 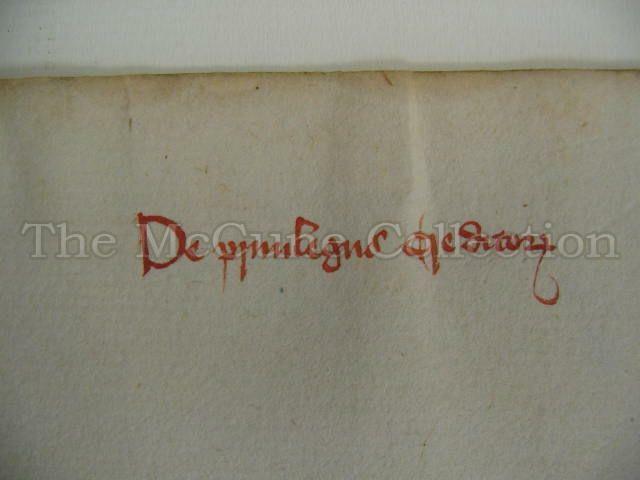 On both recto sheets, there are running titles in contemporary script in red ink at the top right of the pages. 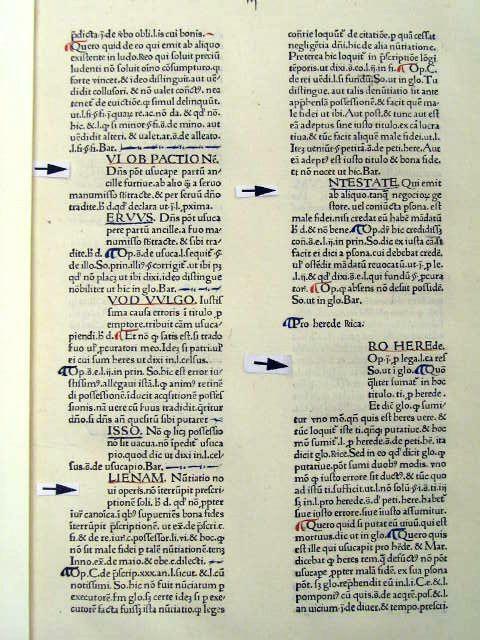 Wendelin von Speyer [also spelled da Spira, de Speier, and Spire] (?-1477) was a German printer who moved with his brother Johann to Venice in 1469 to start the printing movement there. For a short period of time Johann held an exclusive permit (monopoly) on all printing in Venice but this ended upon his death in 1470. 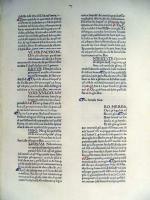 The brothers printed over seventy major works. They were known for their Roman typography. 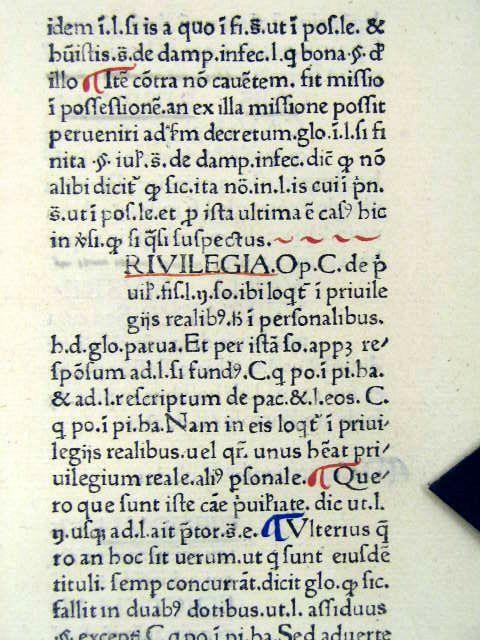 There is a conflict over whether the Speyer brothers, Nicholas Jenson, Adolf Rusch or Pannartz & Sweyheim were the originators of Roman type.